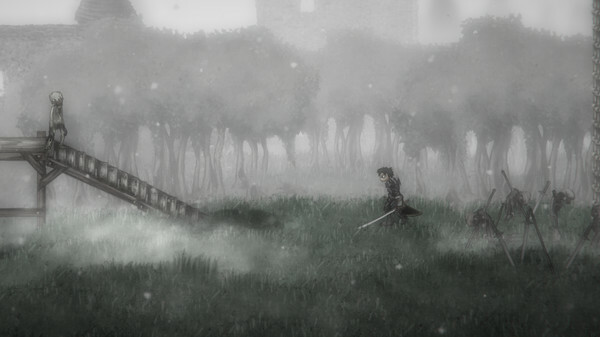 Salt and Sanctuary is now officially available on SteamOS & Linux and marks Ethan Lee's 38th port to our platform. Salt marks port #38, hoping to have #40 out by the end of the summer. Pace should start picking up soon! I didn't realise he had ported so many, I knew it was quite a few but wow he's a porting machine. I personally purchased a copy of the game to support Ethan's porting a few days ago and I just got around to trying it. It's actually really rather good, the combat is especially brutal. The audio is fantastic and is what really makes the combat feel so brutal. I chose a Paladin as my character and the Morning Star I wield has an intense meaty sound when I smash it down on my foes, thump—splat! I do love the fact that I can switch between keyboard/mouse and gamepad any time and the on-screen prompts will change to match, great stuff. Playing with the Steam Controller feels amazing. I got to what I assume is the first boss, the "Sodden Knight" who annihilated me and stole a ton of my salt. Going about as well as I assumed it would then! So far the Linux port quality seems to be great and I've been having a really good time with what I've played so far. Great news!! I like this game!! Will buy some day xD!! i will buy it : ) If i reedem a code on linux it count as a linux shop? fabry92 i will buy it : ) If i reedem a code on linux it count as a linux shop? Likely not, random key codes from other places before a Linux port exists will usually never count as a Linux sale. Been playing this for 12 hours now with two steam controllers. I've encountered no platform specific bugs, the map is huge, the combat is brutal, the enemies are varied and exploring is fun. Highly recommended, although I should warn that with two players platforming gets tricky and you lose control over the camera. I've died from being unable to see my surroundings and/or falling, more times than I've died from actual combat. great news like always liam, love the work you put into GOL ! but so far performance and port are outstanding! or won't it count, anyone knows about that? SketchStick Been playing this for 12 hours now with two steam controllers. I've encountered no platform specific bugs, the map is huge, the combat is brutal, the enemies are varied and exploring is fun. Highly recommended, although I should warn that with two players platforming gets tricky and you lose control over the camera. I've died from being unable to see my surroundings and/or falling, more times than I've died from actual combat. Does that mean it's local co-op and works with the Steam Controller? Damnit, I was hoping not to spend anymore money on games for a while (I think I spent 250 bucks during the steam sale....plus ended up getting Hearts of Iron IV). But this looks/sounds awesome. Hopefully they plan a DRM free version at some point. 442 votes and counting on the GOG wishlist. I've bought it. Thanks to the dev! 38 games? Ethan Lee is a hero!